Eventually the truth comes out. Sometimes it may seem to come out too late, but when it does, the “fakers” are revealed, the liars are shamed, and the faithful are grateful they hung on to TRUTH! If you’re familiar with the show “Singing in the Rain”, you know a very untalented lady was getting away with fooling everyone until… until… until silent movies were no longer silent! At that point her lack of true talent became more and more difficult to hide, and the person who should have been getting the credit, eventually became a true star. Until then, the “faker” was stealing from her! She grew more and more bold in her shameful pride, taking advantage of an honest and good hearted person, and seeming to feel no guilt about it. I wonder how often this happens? I don’t know, but I know it happens too much. Sad to say, politics seems to be the devil’s playground for this very thing. But I don’t write about politics, unless it’s the government of the Kingdom of God, and today I want to begin getting into my personal formula for finding God Balance and staying God Centered. You see, the truth eventually comes out, and all those Churches who have twisted what Jesus was about, won’t be able to hide it for long. More is being revealed every day. So we must look at WDJD. (What Jesus actually did.) The example he gave us. When I did this, I came up with a few things I have put into my own personal formula for spiritual balance, and perhaps it can help you too? You might even have something to add. Please feel free to share. God Task + Inner Circle + Prayer + Simplicity = Balance and Flow… i.e. True Surrender. (The Fight of “No Fight”). Please note, this may look like a “do list” of “7” things, but it’s really only “4”. God Task + Inner Circle + Prayer + Simplicity =. Remember, we’re talking about how to find and maintain a God pleasing “Balance”. Tonight we take a quick look at the first item in the formula, your “God Task”. Do you even know what it is? Can you hear the voice of God to know your personal task? Do you care? Consider how if you know what your personal “Task / Vision” is, how that begins to bring focus and order to your life, if you do it correctly! If you simply add it to an already overly busy list of events and chores, it can bring more chaos and stress! There are several things to consider here. First of all, can you hear that voice? If we were talking face to face, would you be able to tell me the personal “priority” God has been laying on your heart? And I don’t mean something like I need to pray more. This is about your “function” in the body of Christ. This is about the “thumb” being about doing the work of the thumb. If you say “pray more”, then that means you are called to be a Prayer Warrior and should have a prayer ministry. We’re talking this is your ministry from God. It is the ministry of the thumb to be the thumb, and it’s not the same as what the neck does. The body of Christ has an assignment. Are we performing our “specific” part? When I was considering how I find balance in my own life, and comparing it to Jesus, I know I’m very much a “vision” sort of guy. Give me the big picture, Lord, and let me go for it! Let it set me on fire and consume me! Let it force everything else in my life to orbit around it, not the other way around. I want everything to orbit around my “God Task”, not try to fit my God Task into an already over crowded agenda. And I see the same in what Jesus DID. He knew his God-given task, and it centered Him. I’d like to spend a little time on this first element of the Formula. 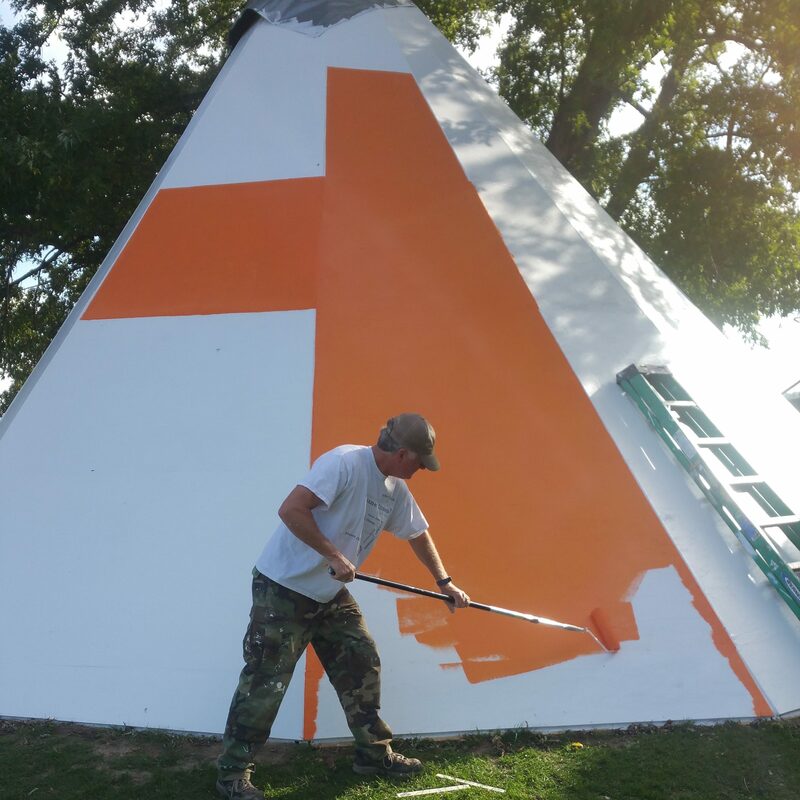 I’d like to share a few things about the “Teepee” in my life. In the meantime, think about what your personal God Task is? That one thing that stands out above everything else. If you’re honest with yourself, do you know what it is? If so, does your life orbit around your assignment from God? If you don’t know what it is…why not? Too busy? A sure sign of an out-of-balance life. Why continue in shallowness and complexity when you can have simplicity and depth? A good first step in the right direction is honestly asking God…“Lord, is there something special you want me to do?” Is there a VISION I am failing? If done correctly, your God Task will bring peace, joy, serenity, and satisfaction to your daily living. It will give you a fire-burning reason to get out of bed every day, even when you don’t feel like it. Especially when you don’t feel like it. So says Grandpa White Feather. More soon. Hope you enjoy. Peace we have; and peace we teach. point to point correct !